i know you can tell from my clever styling exactly what this is meant to be. 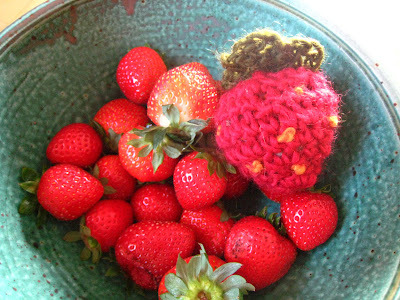 you've seen this type of toy everywhere, and nowadays more often than not they are knitted or crocheted. felted or straight up made from felt! play food! mine is crocheted, and i intend to felt it. i may or may not alter the design and make more of the same type. i've already used this yarn (lamb's pride) for another felted toy (show-and-tell teaser: this one could also be considered play food, but it's not eaten by most people) and it still shows crocheted stitches pretty clearly. i did try knitting a little green pear with a pretty leftover bit of heathery green, but for some reason the shaping was eluding me and i frogged it (another unfinished project done!). here's another pic of it all sewn up. i stuffed it with leftover wool bits. 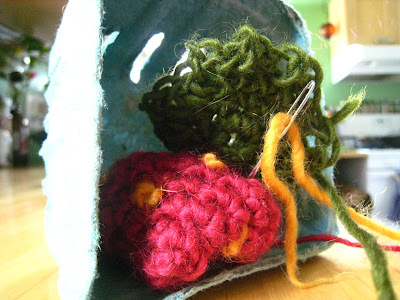 i've got a bag going of yarns ends and cut up sweater scraps that i've been using for stuffing. it especially rocks for these felted things since it felts too! and you know it took me all of one minute to finish it, right? after i tracked down scissors, needle, and stuffing. (did i mention we just moved? i swear things will soon be more organized). i would really love to make this type of toy out of recycled materials as well. i think it could be done with sweaters. not that i'm about to embark upon that at this moment. that is another contributing factor to the mountain. so many ideas! 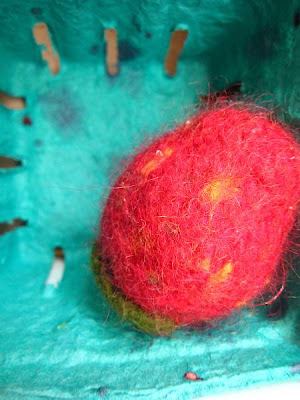 i'm off to install a basket near the washer in which i can place items that need felting. i was wanting to have such a spot in our last place, to encourage my felting prowess, and it is just the thing to inspire me now. the final step in completing this sweetheart. and if you check back, i promise to upload a picture of the felted version down here. oh yeah, and while i'm at it, i'll wash a diaper load too. then i'll really be on my way to hot water washing felting goodness. and thanks to this post, i figured out that i went one whole week between diaper loads! huzzah!! !